PVC DIGIPAK SLEEVE WITH FLAP- PACK OF 50. APPROXIMATELY 150MM x 146MM. HOLDS A DIGI PAK WITH A SPINE APPROXIMATELY 8MM. DIGIPAK NOT INCLUDED. 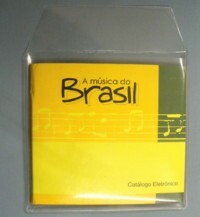 PVC DIGIPAK SLEEVE WITH FLAP- PACK OF 50 APPROXIMATELY 150MM x 146MM. HOLDS A DIGI PAK WITH A SPINE APPROXIMATELY 8MM. DIGIPAK NOT INCLUDED.